Senior Minister of State for Defence Heng Chee How officiated at the launching ceremony of the Republic of Singapore Navy (RSN)’s eighth and final Littoral Mission Vessel (LMV), RSS Fearless 22, at ST Engineering’s Benoi Shipyard. The LMV was launched by Mrs. Heng Soon Poh, wife of Mr. Heng. Speaking at the ceremony, Mr. Heng highlighted the importance of a strong and capable RSN to safeguard Singapore’s sovereignty. He said, «The navy is every maritime nation’s first line of defence. A strong RSN is key to protecting our maritime sovereignty, and keeping our Sea Lines of Communication open. Singapore’s maritime agencies work together 24/7 to monitor threats. The RSN augments this by conducting patrols around the clock – tirelessly – to keep our waters safe and secure. We do this to protect Singapore, Singaporeans, and our Singaporean way of life». On the launch of Fearless, Mr. Heng encouraged the crew to «live up to the fearless spirit of our founding fathers and continue to live out its legacy. As you embark on your next journey to defend our sovereignty, our security, and our economic prosperity, I am confident that you will overcome all challenges fearlessly, never flagging in adversity». 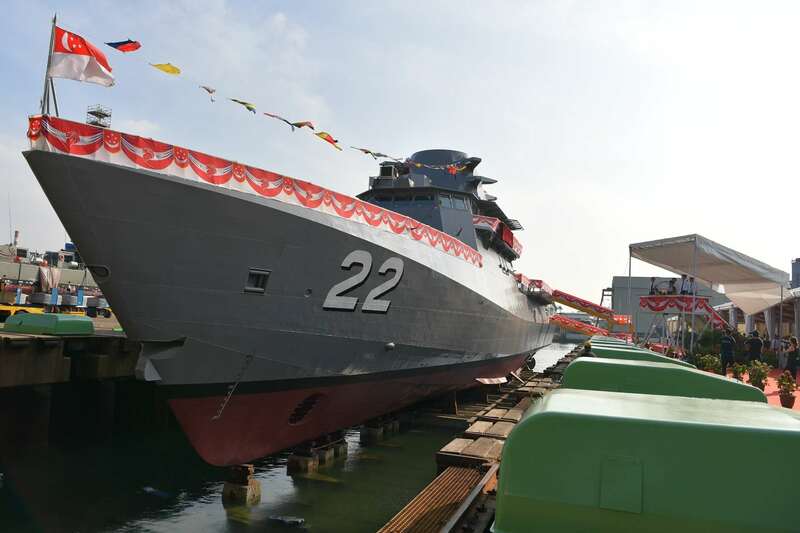 The launch of RSS Fearless 22 is a significant milestone in the RSN’s continued transformation to enable it to continue safeguarding the sovereignty and security of Singapore’s waters. The LMV programme is progressing well. Since 2017, five LMVs – RSS Independence 15, RSS Sovereignty 16, RSS Unity 17, RSS Justice 18 and RSS Indomitable 19 – have been commissioned. They have rapidly assumed and effectively executed operational duties, including the DPRK-US Singapore Summit and daily maritime security patrols, and have participated in exercises such as the ASEAN Multilateral Naval Exercise and Singapore-India Maritime Bilateral Exercise. LMVs Fortitude and Dauntless, launched in 2018, are undergoing sea trials and will be commissioned later this year. All eight LMVs will be fully operational by 2020. Also present at the ceremony was Chief of Navy Rear-Admiral Lew Chuen Hong, as well as senior officers from the RSN and the Defence Science and Technology Agency.